I just wanted to take a moment to wish you a Happy Anniversary. And to tell you that this card is beautiful!! I love the way you colored the flower!! The colors are awesome!! @Tosha and Laura - thank you ladies for the wonderful comments! I appreciate you taking time to visit my blog! Happy anniversary! What a ncie thing to do to encourage your co-worker. She is absolutely going to LOVE this. It is really fabulous. 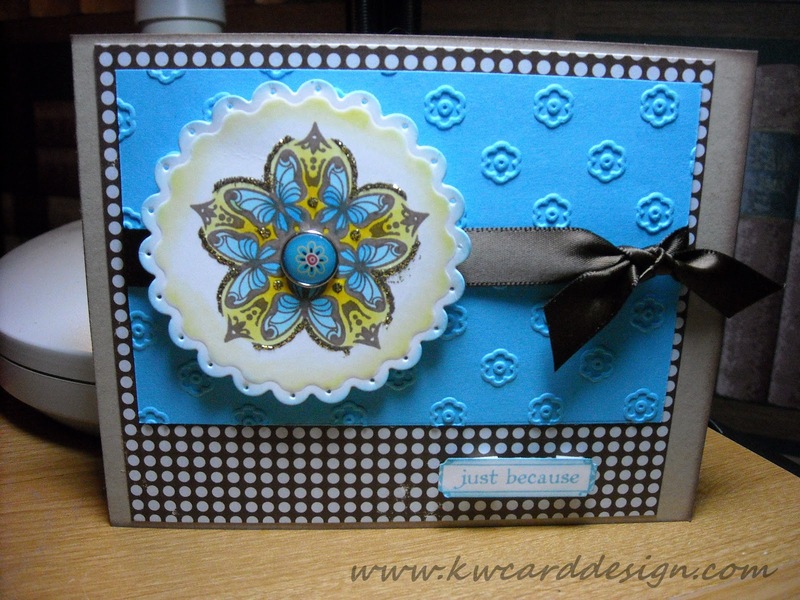 And I love that embossing folder you used, do you know the name of it? Thanks! @Sandy O. - Thank you for the sweet comment! My co worker loved it!! She has it displayed at her desk! @Rachel - I don't know the name of the folder because I bought the new version of the cuttlebug machine and it came with the machine wrapped in thin plastic. It didn't have a name. So sorry! :o( Thanks for your well wishes for my anniversary!